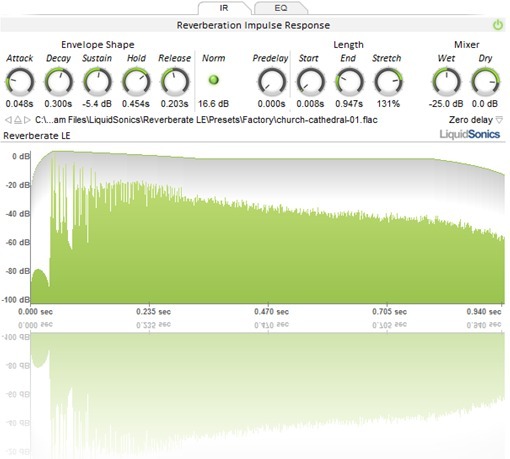 Reverberate from LiquidSonics is compatible with any platform like Xp , Vista , 7 or MAC. The manual that is included with the program is easy to catch , enough to obtain the necessary information of how the reverb works and reacts. The setup doesn't require a lot of time or effort , it's very fast and easy to follow. The software from LiquidSonics works beyond great , the program is very stable , provides a very delicate touch of reverb , some high quality reflections and time delays. I'm getting great results while using this product , it really helps to combine different sounds and colors to other instruments or sounds. Reverberate is a dual true-stereo convolution reverb with a lot of presets , around 144 which I totally enjoy using , some stereo delays with modulation for IR2, IR2 and after effects. I also like the interface , a very catchy design that incorporates a sample browser , some EQ and LFO modulation and of course early reflection module. Another remarkable aspect of this program is the full file support for wav, SDIR, aiff and flac. You get other awesome features that are low CPU down sampling mode option and 0 latency response. My opinion about the value for the price is awesome , extremely cheap product , only about 50 $ , but you get a very complex and professional sounding reverb. Precision and quality of the sound is also pro , the tale sounds realistic , the effect that is has on the shape of the sound is great , 9/10. I've tried different reverbs , some way more expensive , some cheaper , this one is better than average and not as good as Aether for example. Knowing what I know, I'm quite sure that I would get a bigger reverb in terms of price and quality , but having said that , for its price range , this is probably your best choice. The program works without and problems on Windows XP, Windows Seven or MAC OS , so compatibility issues shouldn't be present. The manual that comes along with the program is great , you get a decent understanding of the program itself and how you can tweak the reverb to achieve certain effects or room size. he general configuration and setup is quite fast , it went very smooth and easy , and it took me just a couple of minutes to get it done. The software works very good in this configuration , the program itself is very designed , made and done. The gear and software are quite stable and in time of using this program , I hadn't had any problems with it. I've been using Reverberate for some time now , it's been probably a couple of years. What I like most about it is that this is a complex reverb , you have a lot , a lot of editing windows , a lot of presets to choose from , and also besides that , you can create your own vintage kind of reverb , you can edit the angles , the room size , the amount of the reverb , you practically get full control over the reverb. I also do like that blue designed window , I like how straight forward and simple they kept it even if this is probably one of the most complex reverbs out there. However there is something that I don't really like , that is the cpu usage , this consumes a lot of resources , this is probably the only down side of the program , apart from that , everything is very very good. Precision and quality of the sound I would rate 10/10. Knowing what I know, if I would have a powerful pc , then without any questions I would get this product and use it in a wide variety of mixes. There weren't any kind of compatibility issues in the program worked really great. The book provided by the program was pretty clear regarding the general configuration of the program and how the settings worked. General configuration and setup is pretty easy. The typical functions are accessible fro a nice window in the great design that has a lot of editing options to choose from and many presets provided by Reverberate. The software performs incredibly well, the gear is stable and I've been using it for two years and I still use it in all of my mixes. I'm getting high-quality results with the touch of Reverberate either on my synths sounds, on my piano sounds, I basically use it for all of my instruments. What I like the most about it is the high quality reverb that is provided, I also must mention how advanced this Reverb is, you can tweak almost any aspect of the reverb not just some like you find in some more basic reverbs. You also have a lot of build-in presets, you have 48 presets different to choose from. You have multiple channels where you can set the exact settings regarding the tale, time, decay , attack, preattack, hold, and many other features. Precision and quality of sounds is extremely good and pro, I use 2 reverbers, Reverberation and Aether, they are the best in terms of sculpting the reverb and the sounds, basically this reverb can be used either on vocal mixes or in many musical instruments. But having said that, this reverb requires some high cpu resources, so keep that in mind when you're using multiple instances of this reverb. I've tried many reverbs, I stuck with two, as I mentioned Aether and Reverberate, to get some crazy effects you can mix them up and create some unique reverb, or you can just pan one left other right. 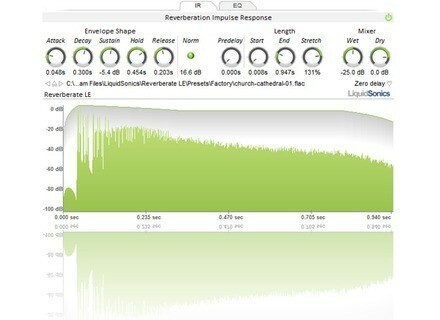 LiquidSonics has updated Reverberate to version 1.660.